Oriental rugs are popular because they are much more superb than regular designs, giving a room more style and distinction. Expert rug makers in China make these oriental rugs, using their abilities, and proficiency in choosing out each rug’s foundation through their various types, patterns, functions and colors. The various oriental rugs come from such places as China, Vietnam, India, Tibet and Nepal. In most locations, the creators of these rugs have their own particular ways of fabricating the rugs, in which they create different designs that can fit in various home styles. For properties that tend to be more classy and fashionable, antique or oriental rugs are becoming more popular. These types of rugs, with their diverse styles and colors, may be a wonderful addition to your home as well. Along with choosing an appropriate oriental/antique rug for your home should come the research in acquiring the knowledge of how to properly maintain and care for these types of Asian rugs. Those that are made out of wool or silk can be carried out by hand knots. A lot of the time, these knots on a standard carpet can surpass more than one hundred for every square inch. This means that the work in making the rug is highly demanding, but makes the rug very long lasting. These types of rugs should be cleaned regularly for longevity. It is also a good idea to scrub your oriental or antique rug every three to five years, on top of the regular cleaning. Additionally, it is also a smart idea to have your oriental carpets washed by carpet cleaning experts every so often. When cleaning the oriental carpets yourself, try to remember not to use harsh chemicals because they will decrease the natural oils on the fabric. Also, never put the rug in a washer, as this may ruin it. 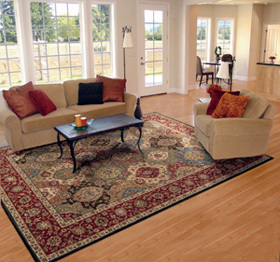 Improving your property or business with antique/oriental rugs is great way to enhance the atmosphere of your space. So, if you’re doing some interior planning, make sure to consider an oriental rug to tie them room together; more often than not, the price of the rug will be worth it.